Velamma Dreams Episode 11 – Vela Forgets Who She is? While making out in the shower, Velamma and Ramesh slip and hit their heads. 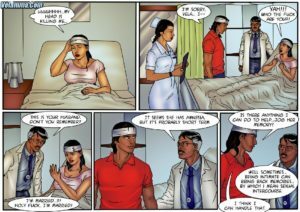 In the hospital, Velamma is diagnosed with Amnesia and forgets she is married to Ramesh. When he fails to satisfy her in a bid to bring her memory back, Velamma walks out to find someone who will and ends up in a club.